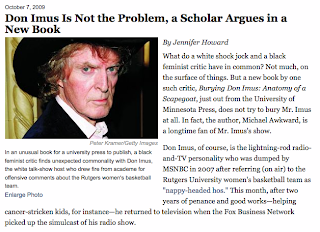 Howard also addresses the fact that, while the book analyzes examples of popular and publicized "knee-jerk assumptions" in complex situations (such as the Imus debacle), Imus himself has gone out of his way to distance himself from this book. He recently ordered the dismantling of banner ads that were set to run on his website. While he has acknowledged the book's presence on his show, he prefers to refer to it as "that book that guy wrote about me." Recently interviewed on Imus in the Morning was Debra Dickerson, who is criticized in Burying Don Imus for a reaction to Imus's 2007 on-air comments that was, Awkward writes, "the most startling example of the tendency of blacks to see white humor as a manifestation of racial hate speech from which we need desperately to be protected." (Dickerson to Imus): "I rarely read something that so conclusively makes me realize I absolutely didn't know what the hell I was talking about ... had I been a longtime listener of your show I think I would've had a completely different reaction." -Check out a recent UMP blog post in which Awkward directly addresses prevailing questions about his book's content. -Michael Awkward openly discusses Burying Don Imus on Book TV and takes questions from the audience.